November 16, 2016, 3:16 PM · The fourteen-year-old Mozart didn’t see himself as being a music pirate, mind you. He was just doing the thing he so excelled at, with his musical genius and photographic memory, back in the spring of 1770. He and his father Leopold were in Rome, working their way through Italy for the month as the young Wolfgang performed and studied and learned. Their timing was perfect: Rome during Holy Week. This was the only time and place you could hear Allegri’s famous “Miserere mei Deus” being sung. In the Vatican’s Sistine Chapel, to be more exact, as part of the exclusive Tenebrae service on Wednesday and Friday of Holy Week. It was a big tradition; since 1514, a total of twelve Misereres had been chanted/sung at this service. This twelfth one, a setting of Psalm 51, composed by Gregorio Allegri in the late 1630’s for Pope Urban VIII, had become the mainstay, far and away the most popular Miserere. To attend this service and hear this music was a big deal. Visitors, musicians and travelers would arrange their schedules well in advance to be sure and catch a performance. Why the big deal? Mystery and inaccessibility have a way of adding cachet to any piece of music, particularly one so strikingly gorgeous, at once austere and lushly inviting. The Vatican knew they had a winner on their hands with Allegri’s Miserere and, wanting to preserve its aura of mystery and exclusivity, forbade replication, threatening anyone who attempted to copy or publish it with excommunication. But the teen Mozart was hungry for a challenge, and, well, you know Mozart. He was… spirited. Free-thinking. Not prone to doing exactly as he’d been instructed if he didn’t see the rationale behind it. So, as he and his father attended the Wednesday Tenebrae service, he listened to the incredible choral music, and after the performance, his brain set to work. Late into the night, he wrote it out from memory, note for note. And we’re talking twelve minutes of choral, contrapuntal music. There are two chorus parts, divided at times by two, to create four groups of singers. On top of that are four solo voices that create their own quartet voice. All this stuff going on, a cappella, and Mozart got it all. He went back on Friday night to give it a double check. All it needed was a few minor tweaks. I recently got the chance to hear a performance of Allegri’s “Miserere,” in San Francisco’s Davies Hall. It was an astonishing experience. I’d used my annual subscription’s upgrade pass for a seat right in the center of the premier orchestra section, which I’d done to enjoy the piano soloist in the night’s second piece (coincidentally, a Mozart Piano Concerto). What a stroke of good luck; I couldn’t have asked for a more perfect seat for the Miserere. The singers, a joint effort of the Pacific Boychoir and the San Francisco Symphony Men’s Chorus, lined the aisles on either side of my section. The four solo voices sang from the farthest front terrace section, above where the orchestra is usually seated. The different sections of the main choir alternated during the Gregorian Chant sections, and came together for the polyphonic parts. The result was utterly transporting. What I love so much about this little 17th century treasure is the way it reveals and displays its intriguing beauty with such clarity. Like a really good chocolate mousse, where your mouth registers all these different flavor sensations—buttery, silky, a hint of savory, the mysterious depth egg yolk brings to the equation, rich undertones of dark chocolate brought to the forefront by sugar—all at the same moment. Each is so pleasing. The polyphonic chorus does just that. The Gregorian chant in there keeps it from being too decadent. If you grew up Catholic, that stuff is going to be very familiar indeed. In all good ways (in case you’re a lapsed Catholic and, okay, yes, I should get myself to Mass more often—and I have to say, this makes me want to go). But let’s get back to Mozart. To his sitting there, in 1770, in the Sistine Chapel and hearing this. To the wonder the child prodigy must have felt. The challenge rising up in him. The exact notes of the composition had been kept a secret for over 100 years, after all, like something out of a Grimm Brothers fairy tale. Time for the spell to be broken. Back to Mozart. After Easter, he and his father continued on with their Italian travels. Later in the year, they encountered Dr. Charles Burney, a noted music historian, who, upon his return to England, published the un-publishable Miserere in 1771. To thicken the intrigue, it should be mentioned that Burney also met up with Padre Martini, who owned the third copy. And to thicken the thickening, the Mozarts also met with Martini during the course of that Italy year, when the young Wolfgang studied with him. But I don’t see Padre Martini bringing out his copy of the Miserere as a study guide. Why risk excommunication and thus hell and eternal damnation for a music lesson with a precocious teen? 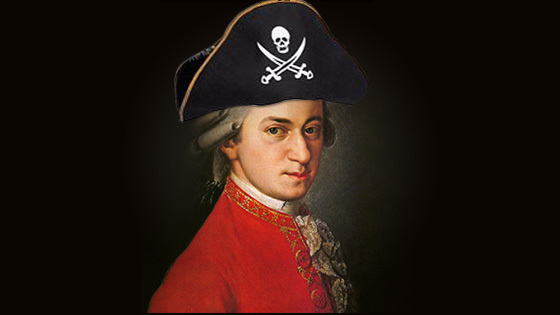 So, was Mozart the first music pirate? I love questions like this because it brings the world of classical music right smack dab up against today's music culture. Let's mix 'em all together, I say, and argue about rap and R&B and Kendrick Lamar, Drake and Mozart all in the same breath. And then sit down together and give Allegri's Miserere another good long listen. November 17, 2016 at 10:41 AM · Aaaarrrrggg! November 17, 2016 at 01:04 PM · Mozart certainly wasn't the first. When Handel premiered an opera in London, it didn't take more than a week before the first simplified editions for recorder or violin appeared in the shops. The editors sent their spies to attend the opera and copy everything they could. November 17, 2016 at 02:23 PM · I'm sure there have been skilled musicians, especially composers, throughout the centuries who have been, and today still are, capable of similar feats, though perhaps not quite so high profile as young Mozart's exploit. Many composers, including Mozart and Paganini, used in their compositions folk tunes, or parts thereof, that they had heard and would have transcribed from memory when they got back home. A few years ago I knew a very good young folk fiddler in my area with, significantly, a solid classical violin training behind him. Before he settled down to a full-time career in engineering he was engaged for a while in doing part-time work for a major European record label (no names, no pack drill!). That label, amongst other things, produced CDs of rock music. My friend's job was to listen to a pre-release recording and transcribe what was played into an accurate score. The importance of this was that the pre-release would contain improvised material (that's the nature of the genre) and the recording company wished to have an accurate paper transcript kept on file so that illegal rip-offs could readily be identified as required. > The editors sent their spies to attend the opera and copy everything they could. Trevor, wow, your story is fascinating, too. I wonder if the young folk fiddler enjoyed doing the transcribing work for pre-release recordings. I'm going to bet that for certain individuals, it would be the musical equivalent of a crossword puzzle. And for others, it would be as tedious as transcribing the Yellow Pages. November 21, 2016 at 02:29 PM · 1. Charles Burney was, if anything, Anglican. A Papal excommunication in Protestant England would have been a status symbol indeed. 2. I hadn't heard about the Vatican threat of excommunication before, in connection with this story. Terez, are you sure that this threat wasn't just to insiders that had been given access to the written music, e.g., performers and librarians, ensuring that the only way the music could be copied would be from memory, which perhaps, the Vatican hadn't anticipated as a possibility? And do we believe that Leopold would have had the guts to hold on to the music if any of his family were to be at risk of excommunication? 3. What is known is that Mozart lost possession of the manuscript while employed by the archbishop (which might have given him insider status).